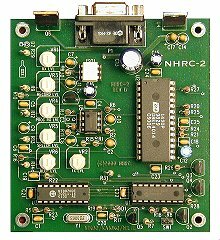 The NHRC-2 is an inexpensive repeater controller with real stored speech and DTMF remote control. It is available assembled and tested, or as a partial kit. The partial kit contains the printed circuit board, a programmed PIC microcontroller, a MT8870 DTMF decoder, and a complete manual on CD-ROM. The manual contains ordering information for all the remaining parts needed to build the controller. Typical cost for building a NHRC-2 (including the partial kit itself) is around $60. NHRC is pleased to present the NHRC-2 revision D Printed Circuit board! This new layout features a smaller footprint, improved power routing to the ISD chip for less noise, as well as silkscreened parts placement on the component side to simplify assembly. Hang timer, ID timer, Timeout timer. Can be built for less than $60.00 (US). Copyright © 1996-2013, NHRC LLC, all rights reserved.